Is there anything more comforting on a cold Sunday evening than hunkering down in front of the TV for another episode of Strictly Come Dancing and some cheese and crackers. We often opt for this lazy supper after a busy weekend and in the winter we don’t want any old cheese, it’s got to be something warm and gooey just like this Festive Baked Camembert! Scroll down for the recipe. This week the weather has really turned in London and we’ve gone from having a mild autumn to a bitterly cold winter. I’m not complaining though. I love waking up to see the frost bitten leaves and the diamond like droplets of dew on spiders webs delicately built between the bare spikey branches of bushes and trees. Now that winter has well and truly arrived I can turn my thoughts to the C word… Christmas! So today when we sat down to our usual cheese supper I decided I had to add some festive flavours! Adding a good quality, sweet yet sharp cranberry sauce works well to cut through the rich cheese while the walnuts add extra texture and the herbs make this one well rounded dish. Christmas wouldn’t be Christmas without a bowl of wrinkly walnuts on the coffee table and this is a great way to use up those extra nuts. I’ve seen lots of recipes that suggest chucking all of the ingredients in with the camembert when it bakes but I think there’s something to be said for stuffing the camembert with the garlic and herbs before baking then spooning on the cool cranberry sauce and toasted nuts for a contrast in temperatures and textures. The flavour experience of a dish isn’t just about sweet, sour, bitter and salty. It’s about the difference between hot and cold, soft and crunchy. 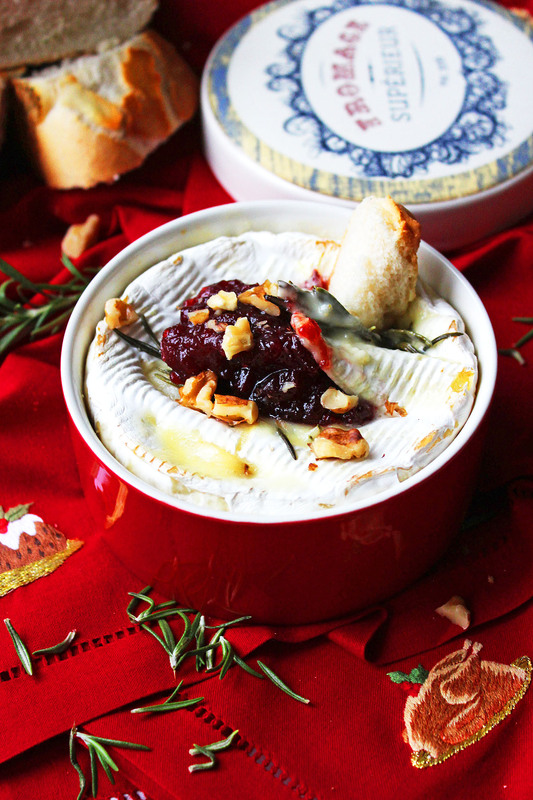 This Festive Baked Camembert has all of this and more! Cheese sir, I want some more! What I love about the baked camembert is that it’s sharing food. No-one human could eat a whole camembert to themselves (trust me…I’ve tried…) and so it’s the type of dish you serve up and everyone dives into. You could just as easily serve this up at the end of a meal as part of your cheese course, on your buffet table, or in front of the TV like we did! Just one word of warning, the best and worst thing about this recipe is the molten cheese. I am a notoriously messy eater and would never be caught dead eating spaghetti with a cream top on! Anything gooey like this festive baked camembert requires a bit of forethought, hence the stack of napkins in the photos! You’ll find these beautiful festive napkins in the Sibona online store (or if you’re in London like me you’ll spot them in Fortnum & Masons!). I was drawn in by the quality red fabric and the fun embroidered motifs. I know you didn’t ask but if I had to pick a favourite it would have to be the Christmas pud! But, enough about the napkins, hopefully by now you’re drooling at the thought of dipping a crusty piece of bread into the ooey-gooey lava of molten cheese. So let’s get you the recipe! Take the cheese out of its packaging and place into an oven dish. Cut slits into the top of the cheese, not going further than halfway through. Peel and slice the garlic and poke into the slits along with the sprigs of rosemary and thyme. Cover and bake in the oven at 150C for 30 minutes. In the last 5 minutes of cooking, toast the walnuts in a frying pan (no oil) for a few minutes until you can begin to smell the toasted nuts. Spoon the cranberry sauce straight on top of the cheese and sprinkle with the toasted nuts. Serve with crusty white bread to dip into the molten cheese. Not had enough cheese yet? Why not check out my definitive guide to building the best cheese board this Christmas. Lovely photos! This would definitely be my choice for a treat! This is my idea of a light snacking dinner on a cold evening! 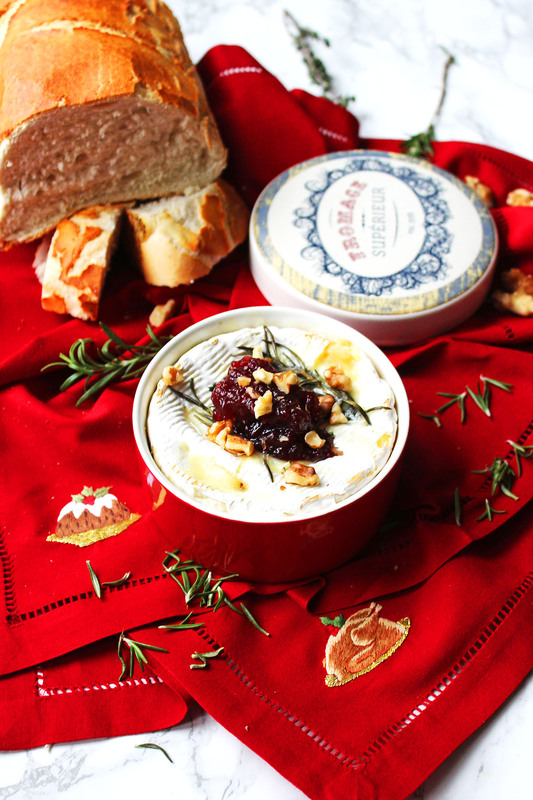 You are right – cranberries are everywhere – but they are especially lovely with cheese and this Baked Camembert is not only tasty but a feast for the eyes too! Now this is MY kind of dish! Cheese plus cranberries! Im in! I love the idea. I have baked brie before but never camenbert. This sounds incredibly delicious. I would love this as appetizer before that big turkey meal! Make two. They will go fast! 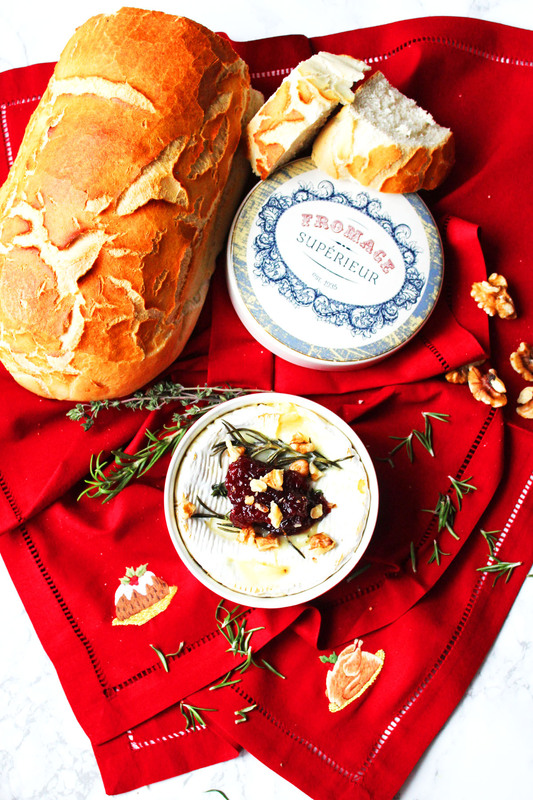 I love baked camembert for this time of the year, this sounds absolutely amazing Emma!